Having a great smile is for everyone to enjoy; it can also boost a person’s morale. But there are instances where some people suffer from dental complications that results in missing teeth. Missing teeth can compromise a person’s bone and facial structure making them more self-conscious and even lose confidence. Not only that, other dental complications can be caused by missing teeth which can affect a person’s dental health and even their overall health. Lakewood Dental Trails wants their patients to achieve their best smiles that is why they offer several treatments under their Restorative Dentistry Service to put the smile back on their patient's faces. Dentures are a type of dental appliance custom-made for each patient who has single or multiple missing teeth. These are made with a gum colored acrylic base that fits over the gums with artificial teeth attached that can resemble the patient’s natural teeth to make it look natural while providing a replacement for the lost teeth. The upper denture replacement is attached to the surrounding teeth which cover the roof of mouth or palate while the bottom part is shaped like a horseshoe to not get in the way of the tongue. A denture is a removable appliance making it easy to clean, but some foods are often restricted since it can stick to the surface and promote bacteria buildup. Dental Implants are another type of dental appliance that can replace missing single or multiple teeth. These are made from titanium posts that are surgically placed on the patient’s jaw bone to serve as the missing tooth’s root. Once the implant is set, it can hold prostheses such as dental crowns, bridges, and dentures. It can promote osseointegration that occurs when the bone forms a natural bond to the implants which further strengthens its attachment and can also improve the appearance of the treatment. The dental prosthesis attached to the implants are custom-made even to resemble the natural look of the surrounding healthy structure which makes it harder to be noticed. A dental implant is a durable and long-lasting solution for missing teeth which if properly taken care of can last a lifetime. Dental Implants are strong and durable but without proper dental hygiene and care it can be damaged over time. Like a natural damaged tooth, an implant can also be replaced and restored back to its original form. Dental Implants Restoration is a procedure where a dentist repairs broken implants or broken dental prosthesis by removing or replacing it entirely. 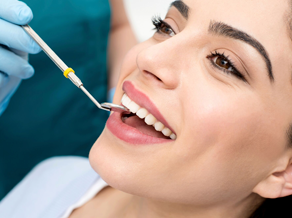 Restorative dentistry is beneficial for people who want to achieve beautiful and natural looking smile by providing several treatments that can repair dental issues by not only restoring the teeth’s appearance but also it’s overall function. Restore and strengthen your teeth Restorative Dentistry in Temple, TX. Call us to book your appointment. We are located at 10252 W. Adams Ave #101, Temple, TX 76502.